Along with their “uptight” cultivated-cousin cabbage, both collards and kale are “laid-back” loose-leaf members of the mustard or Brassicaceae family. They are thought to more closely resemble their ancient, common ancestor the cole-plant. All modern cole crops are the descendants of a single species, a wild sea cabbage, Brassica oleracea var. oleracea, that evolved along the dry coastlines of the Mediterranean and Atlantic coastlines of Europe. They include popular vegetables found in Sonoma County markets today: mustard, broccoli, Brussel sprouts, kohlrabi, kale, cabbage, cauliflower and collard greens. 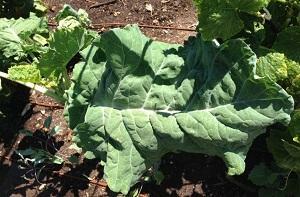 Collard greens, or simply collards, and their closest cousin kale, belong to the cultivar group Brassica oleracea var. acephala (acephala: lacking a distinct head). Commercially, these Brassica’s are biennial plants that are grown as annuals, but may have longer lives in areas with warmer winters. Both have edible, elongated leaves with fibrous veins and tough stems. Compared to the puckered, dark green, aptly named Dinosaur Kale (‘Lacinato’) leaves, or the purple-veined, filigreed Red Russian Kale leaves, collard leaves are large, relatively smooth, light green, sometimes waxy, thick and a little bitterer. ‘Champion’ - 60-75 days. Short-stemmed (2 feet) with long, broad, wavy leaves. Mild flavor. Waxy blue green leaves. Bred for frost tolerance, extended harvest and fast growth. ‘Vates’- 68 days. Slow to bolt. 32-inch plant. Dark blue-green long, wavy, wide tender leaves. Cornell University’s site contains descriptions of additional varieties and their days to maturity. Find them in online seed catalogs. I grow perennial ‘Merritt’ collards, a cross of ‘Vates’ and ‘Georgia’ along with some kale-relative DNA thrown in. Developed by Oakland’s Merritt College, this plant produces a large volume of greens and, to date, has tolerated Sonoma Valley summer and winter weather. 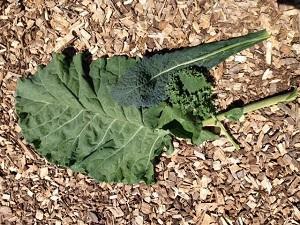 It has a giant dark green leaf with smooth edges and can get 4- to 6-feet tall. It can be cut back hard in winter to re-emerge in the spring. If you save seed, you’ll find ‘Merritt’ to be a prolific re-seeder that’s mostly true to type. ‘Merritt’ has proven to be very drought-tolerant in the coastal regions of the Bay Area. If you want nutritious greens in all Sonoma County seasons and you have the space for it, I recommend that you seek out this variety. As with other cruciferous plants, pests include, but are not limited to, cabbage moth, several species of nematodes and green cabbage loopers. Well-drained soil, with a soil pH of 6.5 to 6.8, will discourage clubroot disease. Soil borne diseases can be avoided and nematode pest buildup can be reduced with crop rotation of your Brassicas. Before cooler weather arrives, use a floating row cover to protect seedlings from insect pests. Some varieties are bred for resistance (e.g., ‘Cascade Glaze’ resists cabbage worms and loopers), or choose variety characteristics that detract (e.g., waxy leaves may reduce cabbage worm infestation). 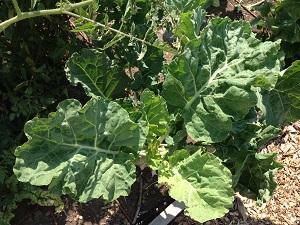 The more the outside leaves are harvested from the collard plant’s dense, flat rosette, the more new leaves grow. Some prefer the younger leaves in the inner rosette, while many harvest leaves from the bottom up which results in a tree-like stem. Young, smaller leaves are tender and sweet with better texture than the larger, mature leaves, but their flavor is the same. Younger leaves can be eaten raw as wraps or in salads, but the more fibrous leaves are usually chopped, steamed, broiled, sautéed or slow cooked down until they are tender. At home, refrigerated fresh collard leaves can be kept for about three days, or they can be stored for a longer time if first blanched, or cooked, and then frozen. Collard greens are a “super food.” They are high in dietary fiber, contain high levels of vitamins and minerals and one cup is only 33 calories. Collard greens are a staple in traditional Southern cuisine. In fact, they are the official vegetable of South Carolina. Collards, when combined with other green leafy vegetables, are called a “mess-o-greens,” and are cooked down to a liquid referred to as collard liquor, or pot-likker. Pot-likker, combined with onions, spices, ham hocks and turkey (or other salted and fatty meats) is traditionally eaten with black-eyed peas and cornbread. When you’re hankerin’ for a pot-likker an’ cornbread, and you’re fixin’ to add a piece of salt pork to that “mess o’ greens” you can get your fix in Sonoma County. Or, keep your Sonoma County farm-to-table kitchen with Chef Rachel Main’s “Famous Coffee & Brown Sugar Spice Grilled Tri Tip and Smoky Braised Collard Greens and Caramelized Onions,” and pair it with your favorite Sonoma County varietal.